Here’s one more strange disorder that causes staining of the tissues. Ochronosis is a syndrome caused by the accumulation of homogentisic acid in connective tissues. The phenomenon was first described by Rudolf Virchow in 1865. The condition was named after the yellowish (ocher-like) discoloration of the tissue seen on microscopic examination. However, macroscopically the affected tissues appear bluish grey because of a light scattering phenomenon known as the Tyndall effect. Ochronosis occurs because of deposition of phenols (such as homogentisic acid and hydroquinone) as plaques in the matrix of cartilage. The pigments can also be incorporated into collagen and elastin fibers. 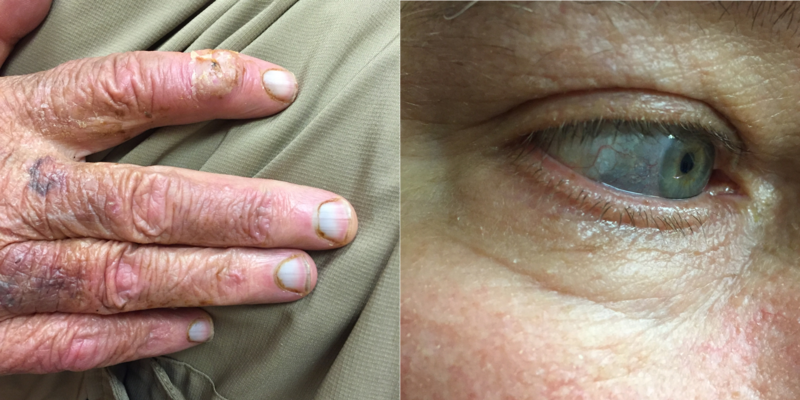 Note the darkening of his fingernail beds and his cornea. You never know what you are going to see from one day to the next in a wound center, do you?